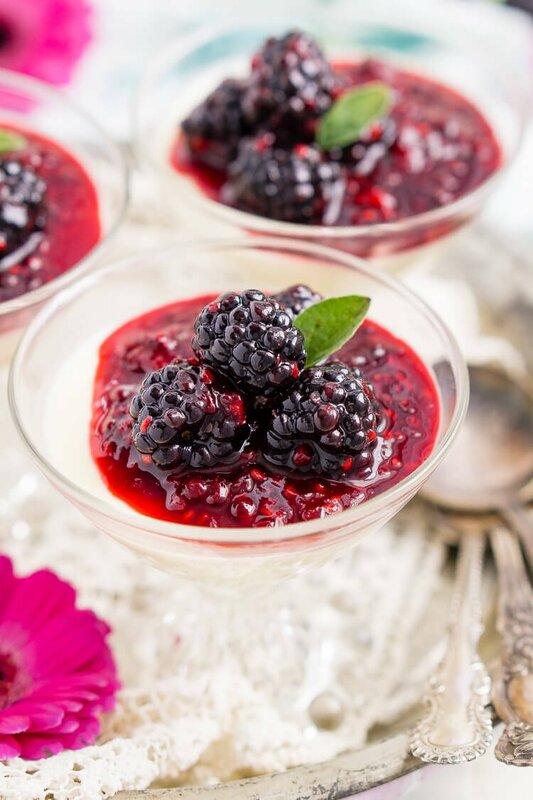 Blackberry Buttermilk Panna Cotta is a delicious Southern twist on a classic Italian dessert. 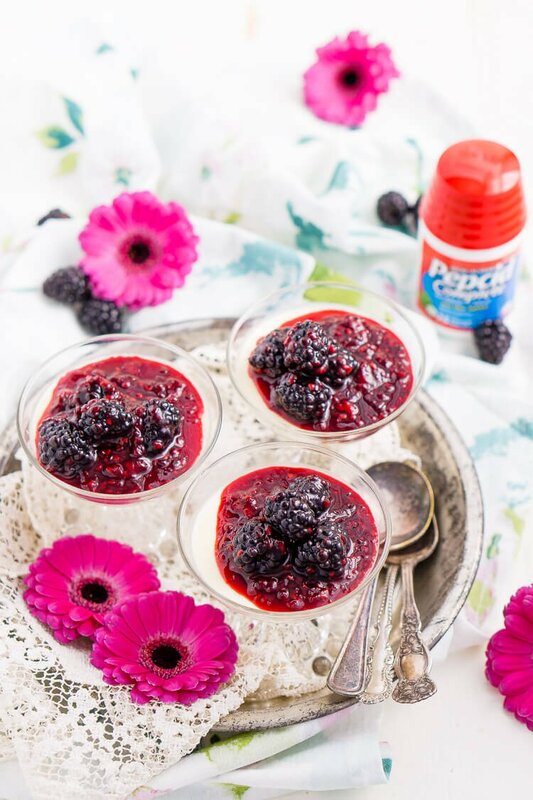 A sweet cream and buttermilk based panna cotta topped with a tantalizing blackberry sauce. 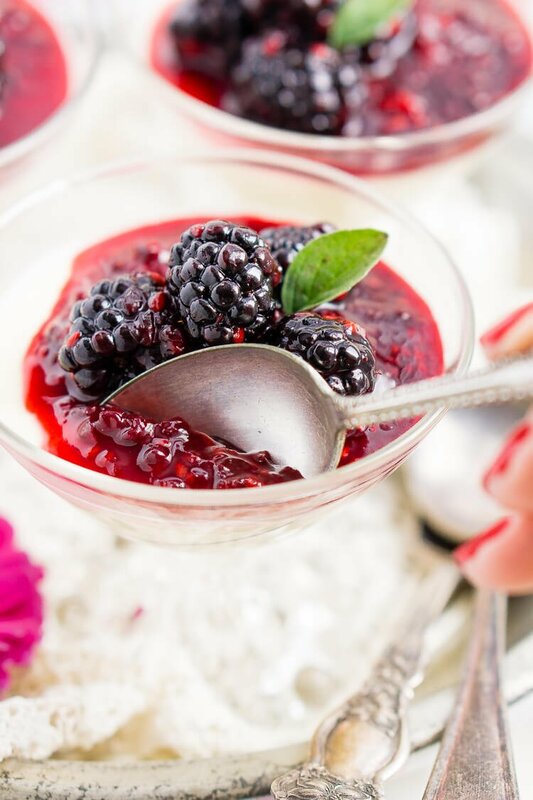 This Blackberry Buttermilk Panna Cotta is an exciting and flavorful dessert dish I can’t wait to make again! It goes without saying that I love food. I began Sugar & Soul to share thoughts, ideas, and of course, recipes! Trying new foods (and combinations) is one of the most interesting, exciting parts of my job. But what some people don’t know is that it can also be a little stressful. 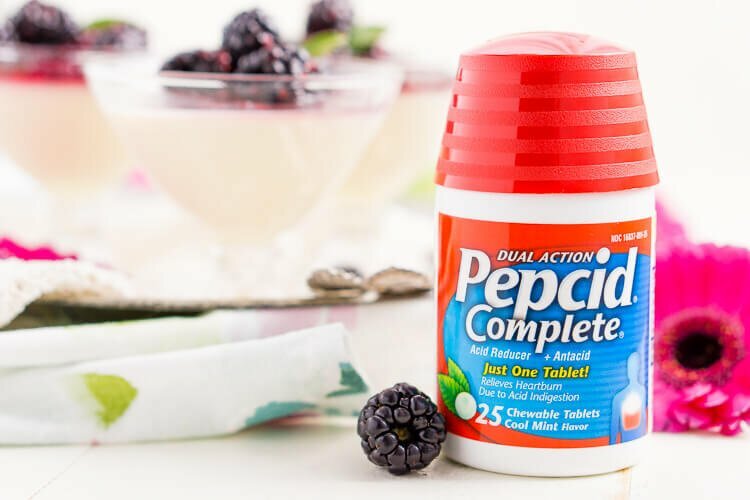 You see, I’m also a heartburn sufferer, and there have been many times when a sharp burn following a delicious meal has just about ruined my day… that is until I discovered PEPCID ® products. Now, I always keep a container of these tablets in my purse, so they’re with me everywhere I go. Knowing that I have heartburn relief that actually works lets me fearlessly try all the new foods that come my way. After all, the joy of eating is when you can savor each bite and tidbit of conversation amongst good company, right? I’m teaming up with PEPCID ® to share their recent 100 Course Dinner in New Orleans. The point of this extravagant feast was “to celebrate that when heartburn is off the table, you’ll want the dinner and conversations to last.” Also known as “Carpe Dinner,” one of the coolest parts of this event was that it was hosted by Chef Isaac Toups at his restaurant, Toups’ Meatery. If you’re a fan of the show Top Chef, you’ll recognize him from season 13, and he happens to be one of my all-time favorite chefs from the show! A 100-course meal sounds like a lot of fun to me, and I could only imagine the delicious fun that they had. I started to wonder what I’d serve as my dessert course if I’d been a chef at this event and dreamt up an idea. Because Carpe Dinner was in New Orleans, I concocted a recipe with a southern twist that everyone could enjoy. Plus, this recipe is worthy to serve at my next dinner party, with a deliciously light flavor and a beautiful presentation. 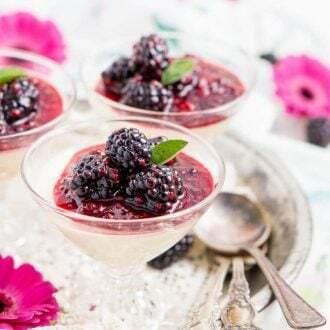 Blackberry Buttermilk Panna Cotta is surprisingly easy to make, requiring even less effort than cupcakes, in my opinion. The actual hands-on time is only about 20 minutes or so, as most of the recipe time is inactive cooling and chilling. The panna cotta needs to set for about 6 hours before it’s ready to eat, which is perfect because you can make it ahead of time without worrying about last-minute prep after your guests arrive. With a nod to the South, the smooth flavors of sweet cream and buttermilk combine with a touch of lemon and vanilla. Gelatin makes the mixture firm, and once it’s set, the texture is silky and smooth; it almost tastes like a cheesecake (but without the cheese and eggs). 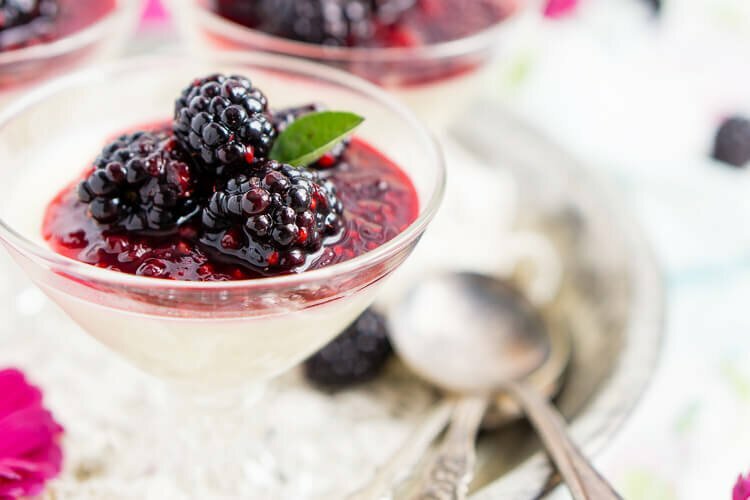 The panna cotta is topped with a luscious sauce made of tangy blackberries, lemon juice, and sugar. All you have to do is simmer all three ingredients in a pot on the stove, then cool. 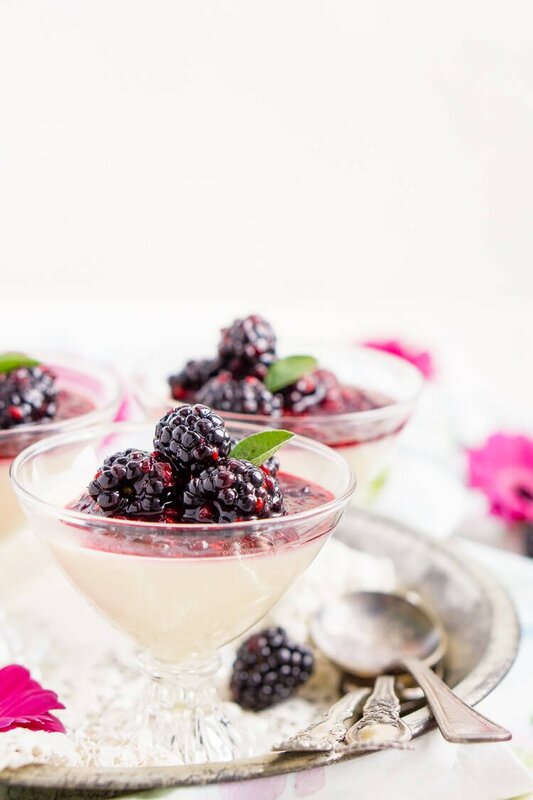 This Blackberry Buttermilk Panna Cotta looks elegant when served in vintage bar glasses or parfait dishes. Without the threat of heartburn throwing a wrench in my evening, I can’t wait to make this recipe for my next get-together. Thanks to PEPCID ®, I have the freedom to focus on the delicious flavors of the meal while sharing laughs and stories with friends and family. I may never serve 100 courses, but Blackberry Buttermilk Panna Cotta will be the perfect sweet ending to the night. And just because we’re serving up the dessert today, doesn’t mean you should skip out on a fantastic main course or side dishes! Check out the 100 Course Dinner website to find more great recipes and inspiration or check out some of my other recipes! 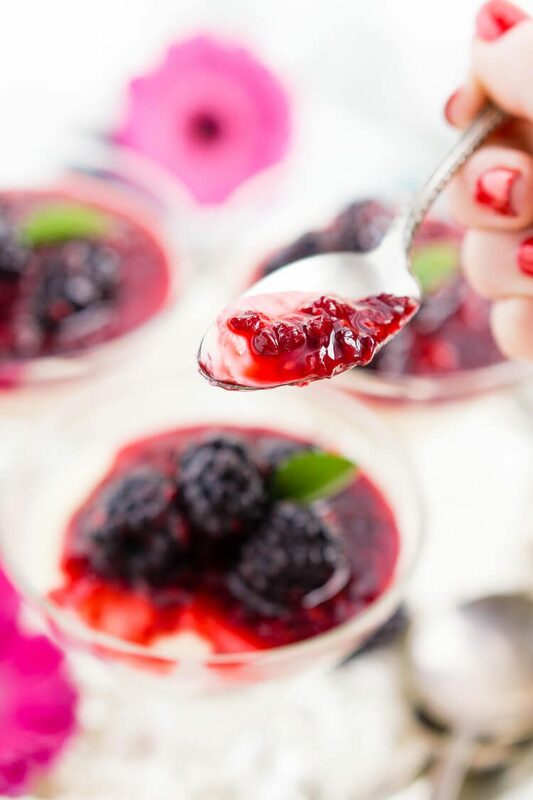 This is my absolute favorite panna cotta recipe to make, and if you’re not a blackberry fan, I’ve made with raspberries and chocolate too! 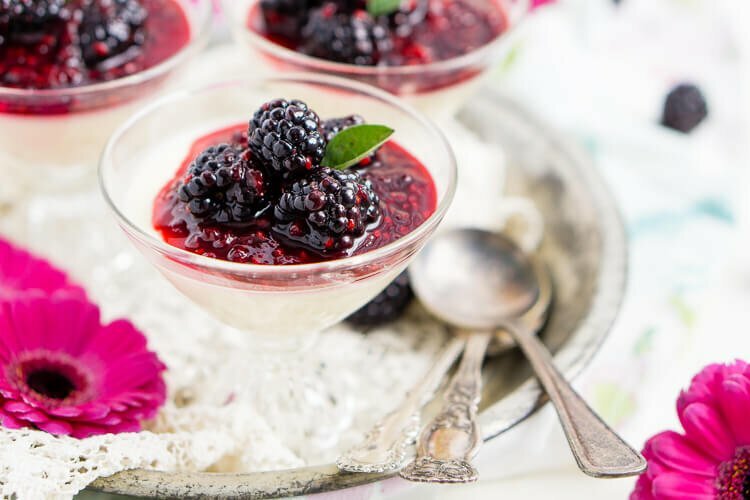 Blackberry Buttermilk Panna Cotta is a delicious Southern twist on a classic Italian dessert. 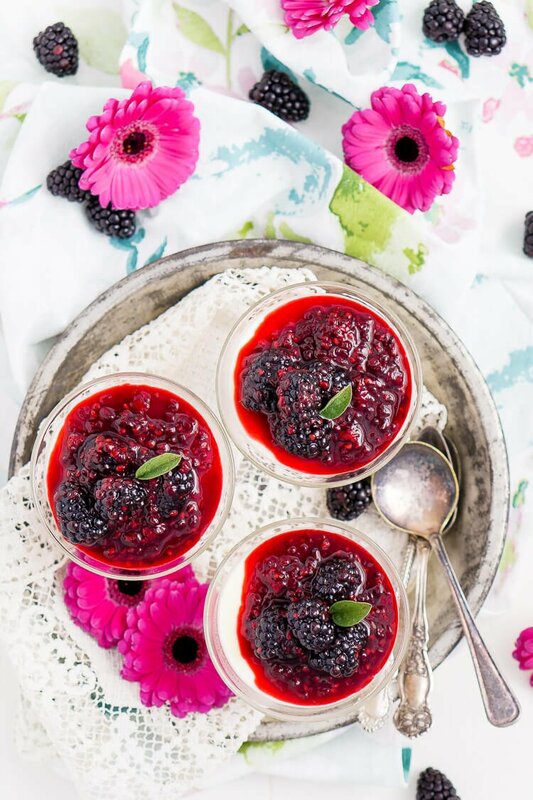 A sweet panna cotta topped with a bold blackberry sauce. Add cold water to a small bowl and sprinkle the gelatin over it. Stir to combine and let sit, the mixture will become rubbery. While the gelatin sits, pour the heavy cream and sugar into a large saucepan, whisk together and cook over medium heat, stirring occasionally. Add in the lemon peels. As small bubbles begin to form here and there, remove from heat and add the salt, vanilla, and bloomed gelatin to the pan, stirring until gelatin has dissolved. Whisk in the buttermilk and lemon juice. Strain through a sieve to remove the peel and any lumps. Pour into 8 small serving dishes or ramekins and allow to cool to room temperature. Once the mixture has cooled, cover with plastic wrap and chill in the fridge for at least 6 hours, preferrably overnight. Add 6 ounce of blackberries, sugar, and lemon juice to a small saucepan and cook over medium heat for about 5 minutes, bringing to a low boil. Use a wooden spoon to help break down the berries into a seedy pulp. Stir in the remaining berries and allow the mixture to cool to room temperature before spooning over the chilled panna cottas. 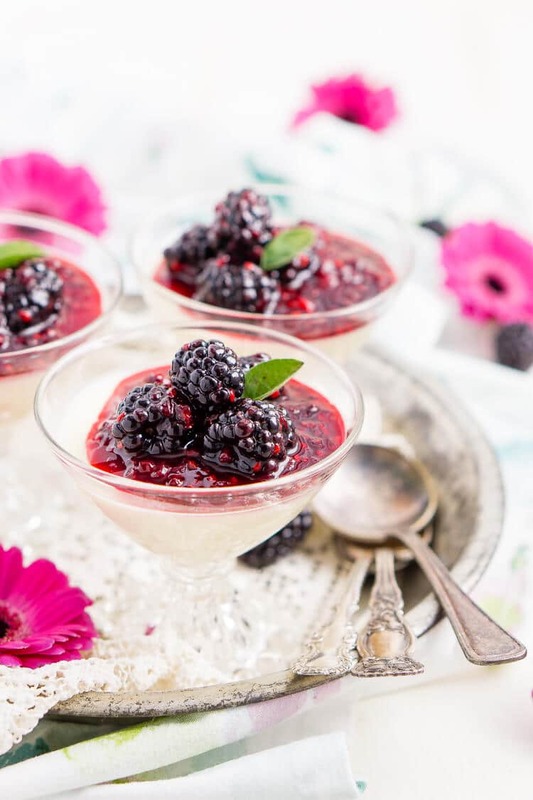 Panna cottas can be served immediately or placed back in the fridge until ready to serve. Buttermilk Panna Cotta slight adapted from Chef John. Not a blackberry fan? Any berry can be used in its place. Well this looks amazing. I never knew it was so easy to make. And 100 Courses sounds like a ton of fun. We should try it sometime. You bring dessert! This was a big hit with company. Delicious, light and refreshing after a heavy meal. Very easy to make, however, I did use a 16 oz. package of frozen blackberries and put 2/3 cup of sugar instead of 3 tablespoons, as I like berries a bit sweeter. I will definitely be making this recipe again. Oh, I’m so glad. And don’t you love that something so elegant is also really easy to make! Thanks for the note about the frozen blackberries, that will be helpful to others! It’s super delicious and easy to make. Thanks for the recipe.